Standard lenses transmit only about 91% of light to the eye. The rest is lost to surface reflections. Anti-reflection coatings were developed to reduce reflections for camera lenses and have now become available for prescription glasses lenses. An Anti-reflective coat can provide drivers with an increase in safety with faster recognition of potential hazards on the road, particularly at night-time. The reflection of a streetlamp or headlights on your lenses is practically eliminated. Anti-reflective coatings improve the clarity of your lenses and virtually eliminate reflections others see in your prescription glasses. You'll enjoy direct eye contact, unhindered by distracting reflections! False light in office surroundings can quickly cause eye fatigue and working on a computer can also put significant strain on the eye. Having an Anti-reflective coating will protect your eyes whist working due to the decreased glare, and therefore result in less eye strain. 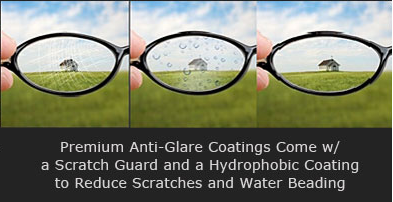 An Anti-reflective coating can further improve the quality and increase the lifetime of your lenses by offering greater scratch resistance, durability and a significant resistance to dirt and water. An Anti-reflective coating can increase the quality and the value of your prescription glasses. Anti-reflective coatings can also help to reduce disturbing or annoying reflections. It will also make your lenses appear much more attractive due to the lack of reflection. You will experience much clearer, sharper and more natural vision with a brilliance that is quite simply not possible with uncoated lenses. • And fantastic looking glasses! Anti reflection coatings are available for all lens options and designs, such as varifocal lenses, high-index lenses, polycarbonate lenses, photochromic lenses and polarised lenses. Please don't hesitate to contact us should you require any further information and one of our advisers will be happy to assist you in selecting the correct options & lenses for your prescription, lifestyle and budget.